Dozens of Palestinians were injured on Friday as Israeli Occupation Forces (IOF) violently suppressed the peaceful weekly marches in Ramallah and Qalqilia in the West Bank. 43 injuries including three rubber bullet injuries and 39 teargas suffocation cases were reported as clashes broke out in Kafer Qaddum town in Qalqilia province, the Palestinian Red Crescent said. 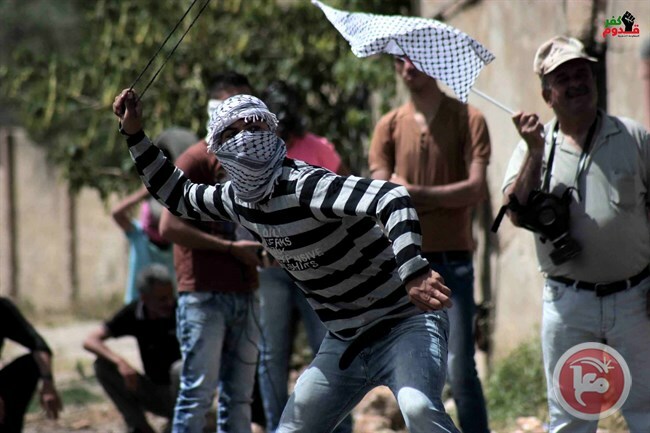 The clashes erupted when Israeli forces stormed the town and brutally suppressed the anti-occupation march with teargas bombs and rubber bullets, causing several injuries. In Ramallah, dozens of protesters including foreign activists suffered breathing problems after being targeted with teargas bombs during Bil’in weekly march. Local sources affirmed that IOF soldiers fired teargas bombs and rubber bullets at the anti-settlement march in Bil’in village, which led to several injuries among the peaceful protesters. Dozens of nearby olive trees were burned due to the excessive use of teargas bombs. The peaceful march kicked off in the village amid large participation of local, foreign, and Israeli activists holding Palestinian and South African flags and banners calling for ending the Israeli Apartheid policies. Also in Ramallah, Israeli forces brutally suppressed the anti-settlement march in Ni’lin village. Local sources affirmed that Israeli forces fired teargas bombs at the march, causing several injuries among the participants. The march was organized just after Friday prayers in protest against Israeli apartheid wall. 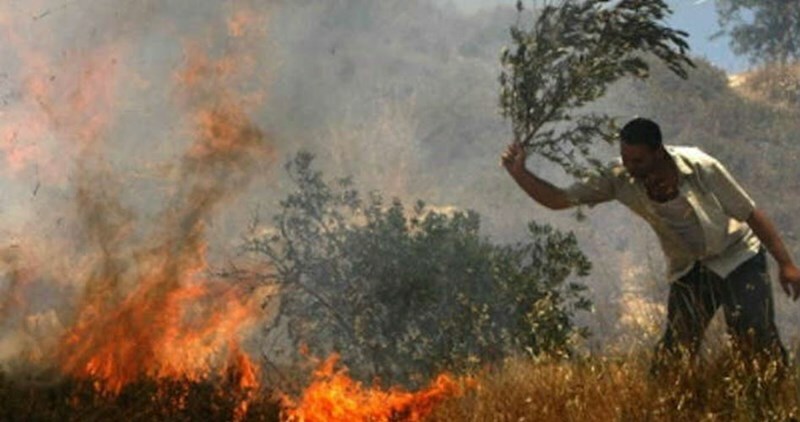 Dozens of dunums of Palestinian agricultural lands were gutted by fire in Surif town west of al-Khalil to the south of the occupied West Bank on Sunday. 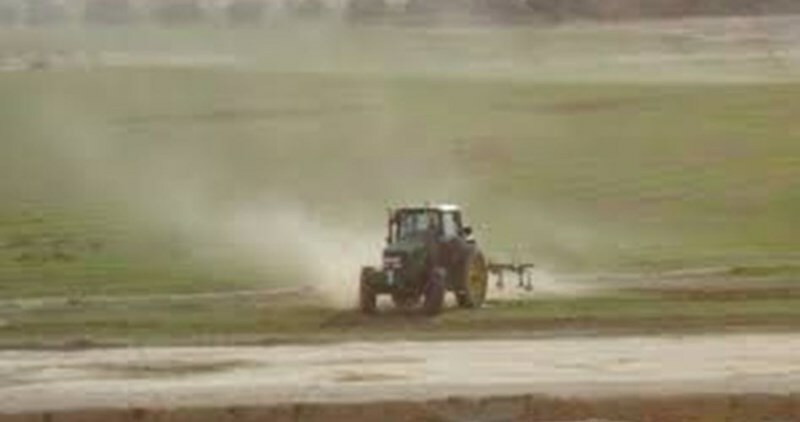 The local activist Mohamed Awad affirmed that a wildfire ripped through 50 dunums owned by Mohamed Hamad. Dozens of olive trees were burned during the fire, he added. Palestinian civil defense crews rushed to the area and managed to put down the fire. A Palestinian teenager was wounded by a rubber-coated steel bullet and dozens others suffered excessive tear gas inhalation when Israeli forces dispersed weekly protests across the occupied West Bank on Friday. 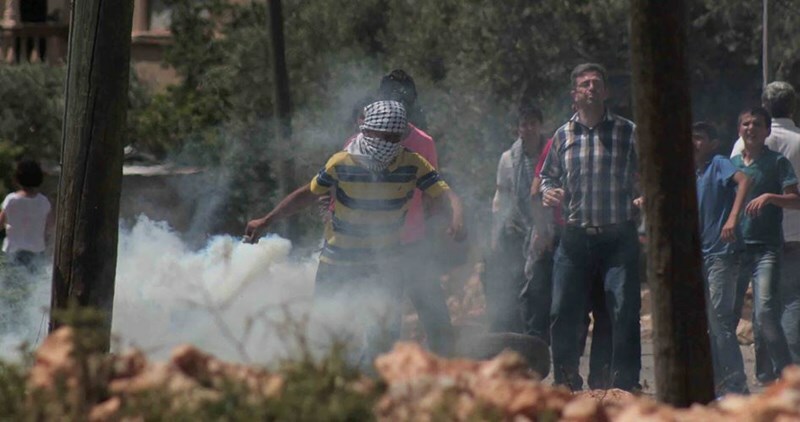 Popular resistance coordinator Murad Shtewei told Ma'an Israeli forces fired tear gas canisters, stun grenades, and rubber-coated steel bullets at demonstrators taking part in the weekly protest in the northern West Bank village of Kafr Qaddum. A 15-year-old teenager was treated on the scene after he was hit by a rubber-coated bullet in the arm. Shtewei said hundreds took part in the protest, chanting nationalistic Palestinian songs and calling for an end to the Israeli occupation. Meanwhile, dozens of activists suffered excessive tear gas inhalation when Israeli forces suppressed the weekly protest in the village of Bilin. Israeli forces fired rubber-coated steel bullets, tear gas, and stun grenades at protesters as they approached the Israeli separation wall. Locals said that a swath of farmland planted with olive and almond trees, belonging to local residents Haytham al-Khatib and Hashim Burnat, caught fire when Israeli forces chased activists in the fields. Many villages in the occupied West Bank and Jerusalem participate in weekly Friday protests, including Nabi Saleh, Nillin, and al-Masara. 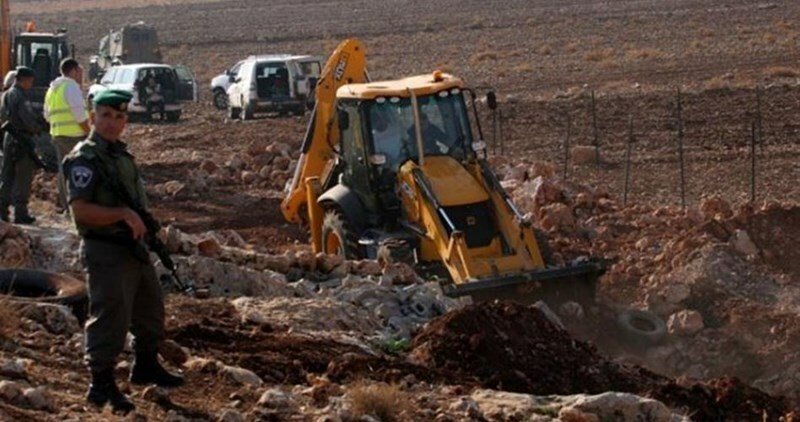 The Israeli occupation authorities (IOA) destroyed Palestinian cultivated lands in al-Khader town, in southern Bethlehem, in favor of illegal settlement expansion. Anti-settlement activist Ahmad Salah said Israeli occupation bulldozers threw debris piled up from the Israeli illegal settlement of Daniel into Palestinian lands. The cultivated lands cover an area of eight dunums and are planted with olive trees and grapes. Several crops were completely damaged in the process. The activist added that fauna and flora around the targeted lands sustained remarkable damage as a result of the IOA's leveling process carried out in favor of illegal settlement expansion. At least seven Palestinians were injured while dozens suffered effects of teargas inhalation after clashes erupted in the West Bank and Gaza when Israeli Occupation Forces (IOF) suppressed weekly marches. 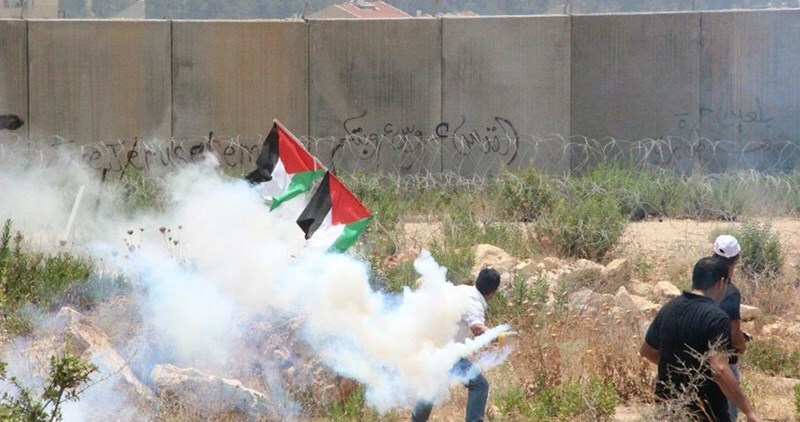 Dozens of Palestinians and foreign activists suffered effects of tear gas inhalation, while at least one was shot by rubber-coated steel bullet when Israeli forces brutally attacked the weekly peaceful march of Bil’in with teargas bombs and rubber bullets. The local activist Rateb Abu Rahma said that head of the village council Bassil Mansour was hit with a rubber-coated steel bullet during the march. Large agricultural lands and dozens of olive and almond trees were burned due to the excessive use of teargas bombs, he added. Similar clashes broke out as IOF soldiers violently suppressed Ni’lin peaceful march west of Ramallah shortly after Friday prayers. The participants waved Palestinian flags and chanted slogans calling for restoring their confiscated lands. During the clashes, one young man was moderately injured after being shot with a rubber bullet in his abdomen while dozens others choked on tear gas. Along the same line, three Palestinians were shot with rubber bullets while nearly 20 others choked on teargas during Kafer Qaddum anti-settlement march. Israeli forces fired a barrage of metal bullets and tear gas towards the participants, causing dozens of injuries among them. Similar confrontations broke out in Azba village when Israeli forces violently attacked an anti-occupation march with teargas bombs and rubber bullets. 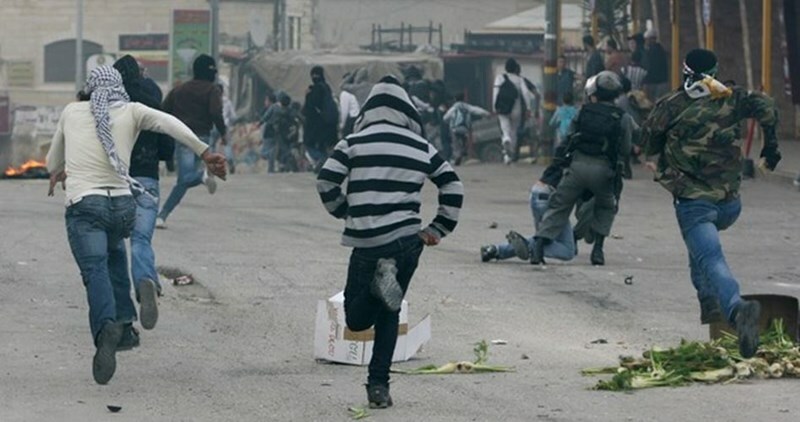 Two young men were injured during the clashes while dozens choked on teargas. A Palestinian and four foreign activists were also arrested during the events and taken to a nearby military camp. In Gaza, three Palestinians were injured on Friday with live fire when clashes erupted with Israeli forces in border areas in the northern and eastern Gaza Strip. Medical sources said that two citizens were moderately injured with live fire near the Israeli-controlled Nahal Oz crossing east of al-Shujayyia neighborhood. A third young man was also injured in similar clashes near Bureij refugee camp in central Gaza Strip. Palestinians in the Gaza Strip demonstrate near the border areas every Friday in support the Jerusalem Intifada taking place in occupied West Bank and Jerusalem. 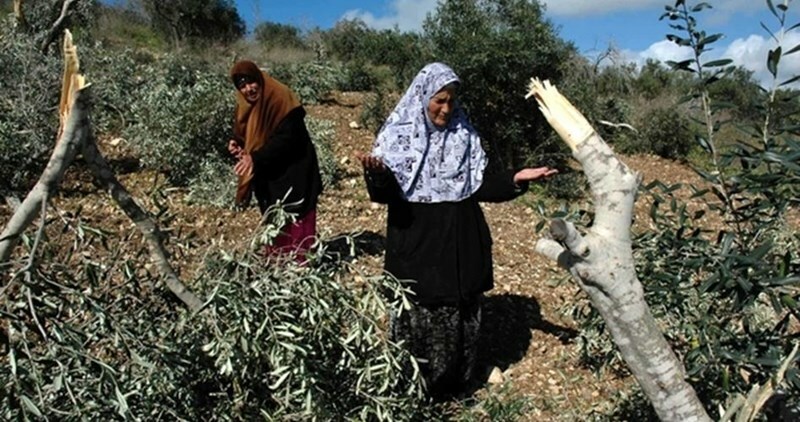 Extremist Jewish settlers uprooted dozens of Palestinians’ olive trees in Deir al-Hatab town to the east of Nablus. Mohammad Hussein, an inhabitant of the town, told the PIC reporter that the settlers uprooted over 55 olive trees from lands adjacent to Elon Moreh settlement. The Jewish settlers deliberately carry out repeated violations against Palestinians and their properties in the West Bank under the protection of Israeli occupation forces. Israeli soldiers stand guard as an excavator uproots olive trees to break ground for construction of the wall section. In May of 2015, Israel commenced with the construction of the apartheid wall in the northern Bethlehem area; namely the area around the Cremisan Valley in Beit-Jala, without taking into consideration the valley’s potential of outstanding universal value. The site is an integral part of the serial nomination ‘Palestine, Land of Olives and Vines’, which also includes the ‘Cultural Landscape of Southern Jerusalem, Battir’. On February 2nd, 2016 the Israeli Antiquities Authorities commenced with an archaeological excavation at Khirbet en-Najjar, which contains ruins of human settlements dating back to the Roman period. In the absence of a final peace agreement, the Israeli occupation is bound by provisions to securing the occupied Palestinian state’s cultural and natural heritage, and is responsible for its protection in accordance with international law -- namely, the Hague Convention and Regulations of 1907, the Fourth Geneva Convention of 1949, and the Hague Convention and Protocol of 1954 for the Protection of Cultural Property in the Event of Armed Conflict. These provisions are in addition to the UNESCO Recommendations on International Principles Applicable to Archaeological Excavations in New Delhi in 1956, the Convention on the Means of Prohibiting and Preventing Illicit Import, Export and Transfer of Ownership of Cultural Property, the 1972 World Heritage Convention, along with other resolutions and recommendations concerning cultural property in Palestine. The archaeological excavation at Khirbet en-Najjar is, according to the PNN, being conducted by the Israeli cccupation’s Antiquities Authority, without informing Palestinians. The initial investigation conducted by the Palestinian Department of Archaeology and Cultural Heritage revealed that several artifacts and objects were found during the excavation, and were confiscated by the Antiquities Authority. Moreover, the construction of the wall in the Cremisan Area, and the archaeological excavation at Khirbet en-Najjar, are considered a clear violation of international laws and agreements. The Palestinian Ministry of Tourism and Antiquities condemned the occupation’s acts of destruction before cultural and natural heritage resources, and is appealing to the international community to immediately take all measures necessary in order to pressure Israel to permanently cease construction of the wall and excavations on and around the Cremisan Valley, and to refrain from further unilateral actions that could inflame the situation. The Israeli Occupation Forces (IOF) arrested Wednesday evening a 17-year-old girl from Halhul town north of al-Khalil. Israeli forces declared the arrest of the girl after she went missing over the past three days. The detained girl is the sister of Hassan Albo who was shot and killed on November 13, 2015 during violent clashes. Meanwhile, two Palestinians were arrested overnight at an Israeli make-shift checkpoint erected between Nablus and Jenin. Local sources told the PIC reporter that the two detainees were arrested when IOF stopped their car at the checkpoint. Several other vehicles were stopped and searched in the area, the sources added. 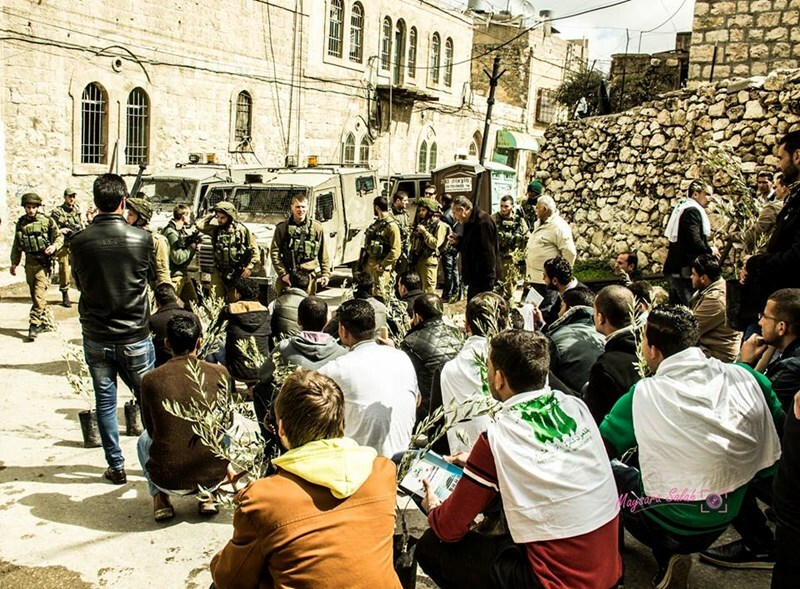 On the other hand, Israeli forces detained dozens of volunteers for several hours in order to prevent their work of planting olive saplings in Naqoura town north of Nablus. The Israeli forces threatened to arrest the activists in an attempt to stop their volunteer work that is a part of the ‘Land is Ours’ campaign launched by the Arab Group for the Protection of Nature (APN) as part of the ‘One Million Tree’ program implemented by the organization. The campaign aims at protecting Palestinian lands located near Israeli outposts from settlement expansion. The Arab Society for Protection of Nature in Palestine planted 400 olive trees within a gardening project aiming at planting one million trees in the Palestinian territories threatened with confiscation and settlement. 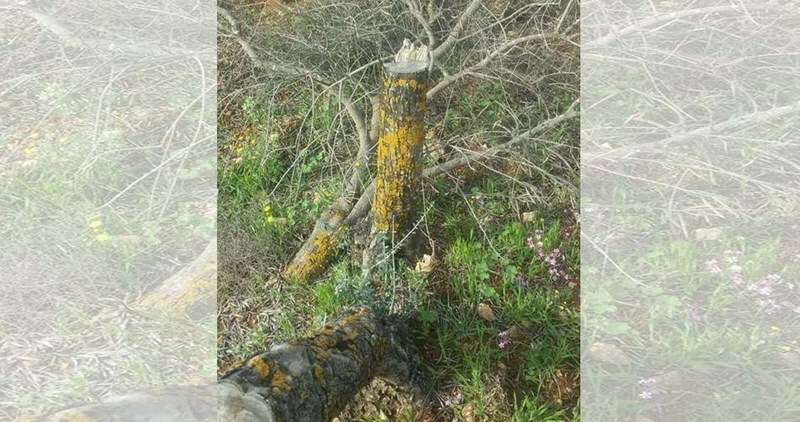 The representative of the Jordanian civil society Hussein Yahya said the trees were planted on Saturday in al-Reheya village in southern al-Khalil within Part Three of the plantation of a million trees project. Yahya pointed out that 120,000 trees were planted in the West Bank in 2015. 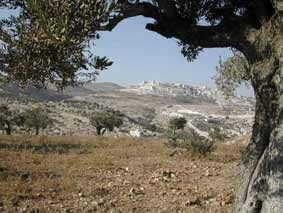 He told Quds Press on Sunday that two million trees were planted between 2000 and 2014. Israeli forces along with Jewish extremist settlers carried out attacks on 22,511 trees including 13,017 olive trees in the West Bank and Gaza Strip in 2015, according to several compatible statistical studies.